(Haverhill) Plenty of excitement in this one. After nine lead changes it was Georgetown breaking away in the last 2 ½ minutes to defeat Whittier, 70-65, in the first round of the D4 North tournament on Tuesday night at Whittier. Neither team was shy about firing the long ones – there were eighteen 3’s made during the game – but the Royals won this one late from inside the arc. A jumper from Ali Newbury (her first shot) put G’Town ahead 65-63. 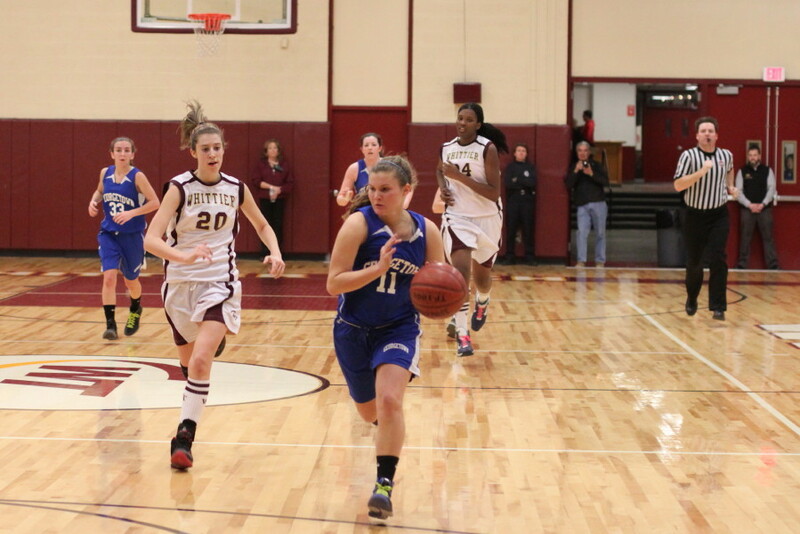 After a Whittier turnover, Kristin Hogan hit a driving layup from the left. 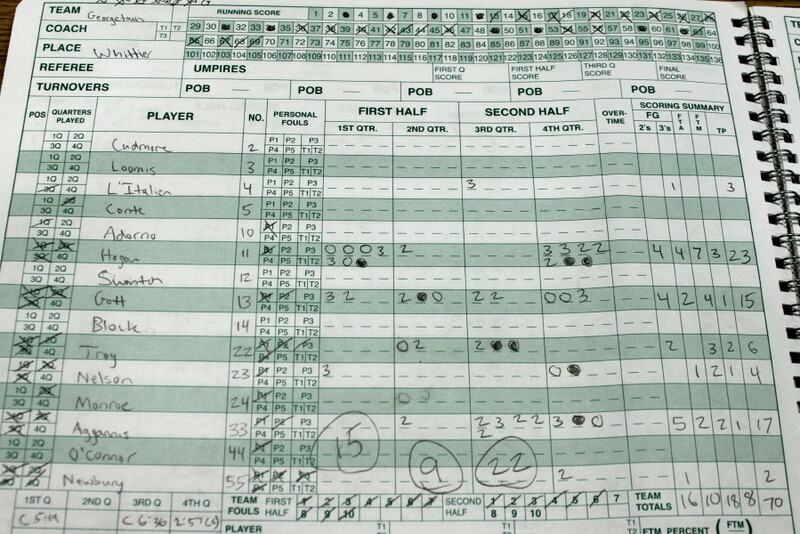 Christina Medley answered with two free throws with 33 seconds left to cut the Royal lead to 67-65. Ten seconds later Marisa Agganis hit one of two free throws to extend Georgetown’s lead to 68-65 with twenty-three seconds to go. 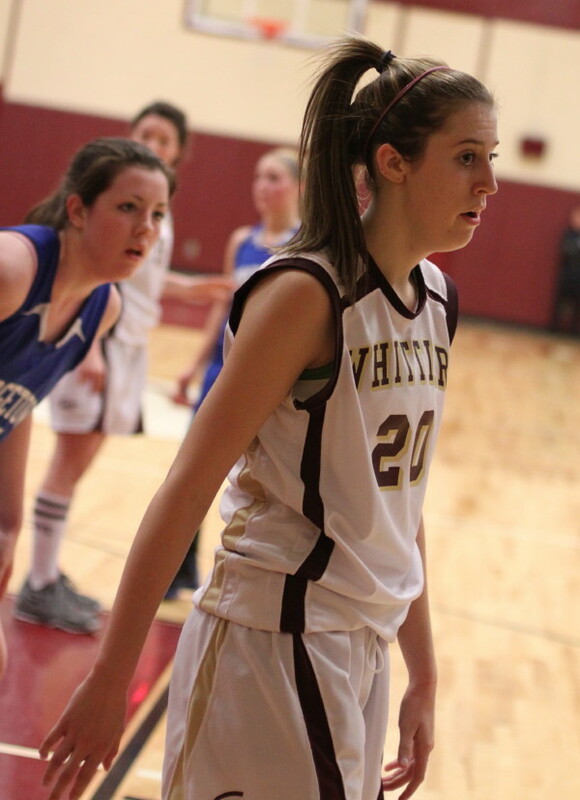 Whittier was still within one-possession range but Christina Medley missed a long three. 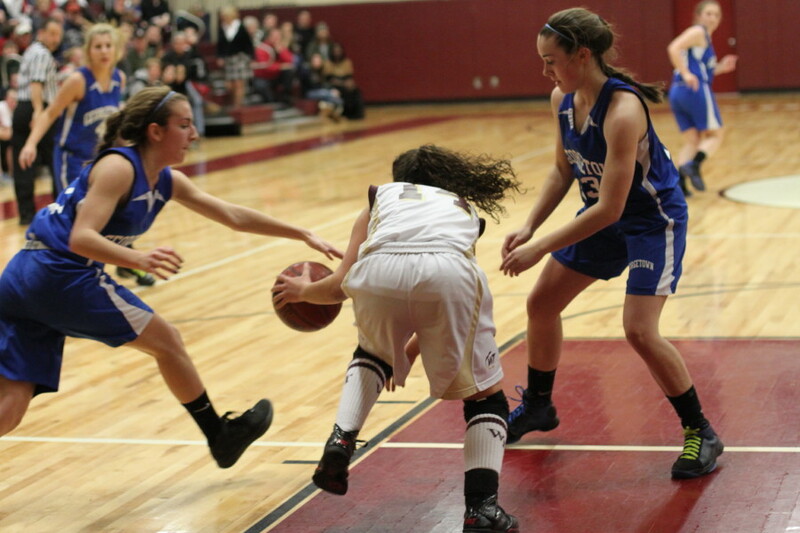 After a Wildcat rebound and timeout Kendra Brasil was called for a double dribble. Kristin Hogan then put the game out of reach with two free throws. Christina Medley (27 points) and Kristin Hogan (23 points) took every open shot that came their way and made plenty of them. 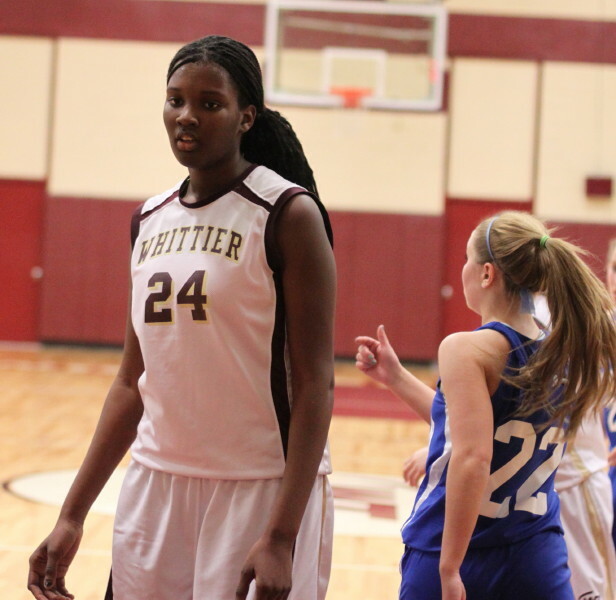 Christina has scored over 1000 points for Whittier. 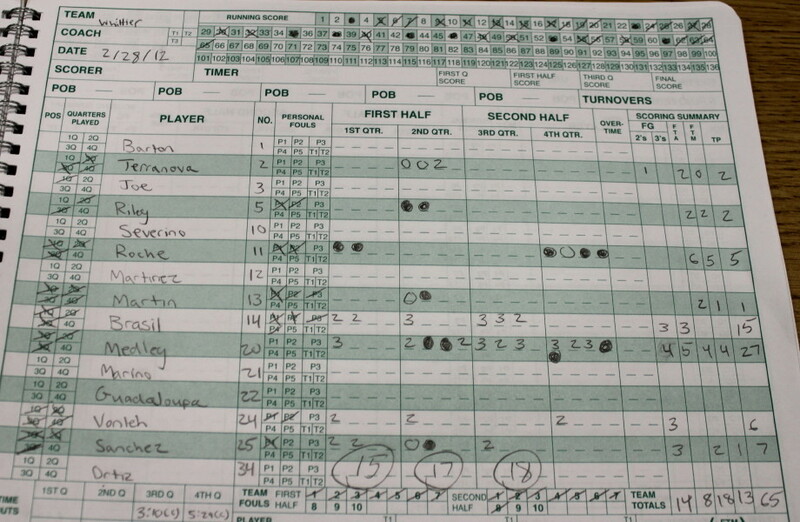 In this one she hit five long ones and put up eighteen points in the back-and-forth second half. Kristin connected on four 3’s and tallied fourteen in the second half. In one sequence in the 4th quarter Kristin made a jump shot and almost immediately stole the inbounds pass and put in a layup. It was about the fastest four points you’ll ever see. After an even first quarter (15-15) the Wildcats built up a ten-point lead (30-20) with Christina contributing a layup, a converted rebound and two free throws. 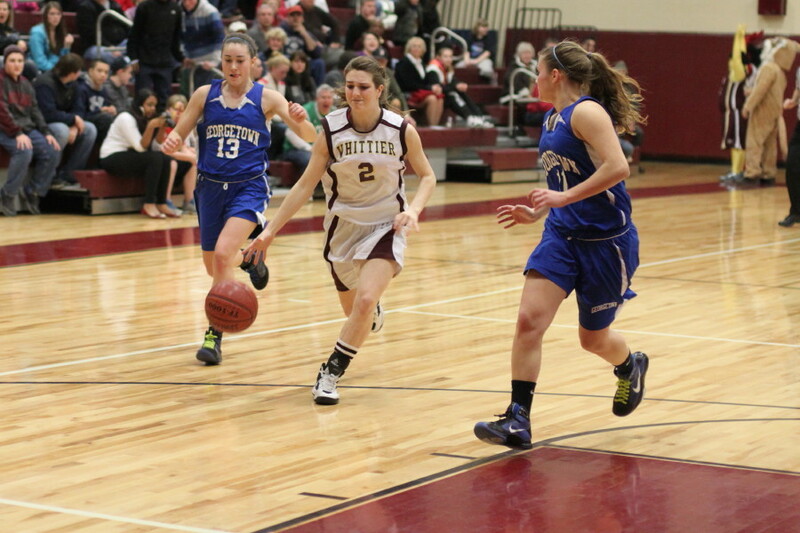 Whittier was ahead, 32-24, at the half. Whittier was still in good shape (38-31) after two minutes of the third quarter before Marisa Agganis and the Royal defense kicked in. 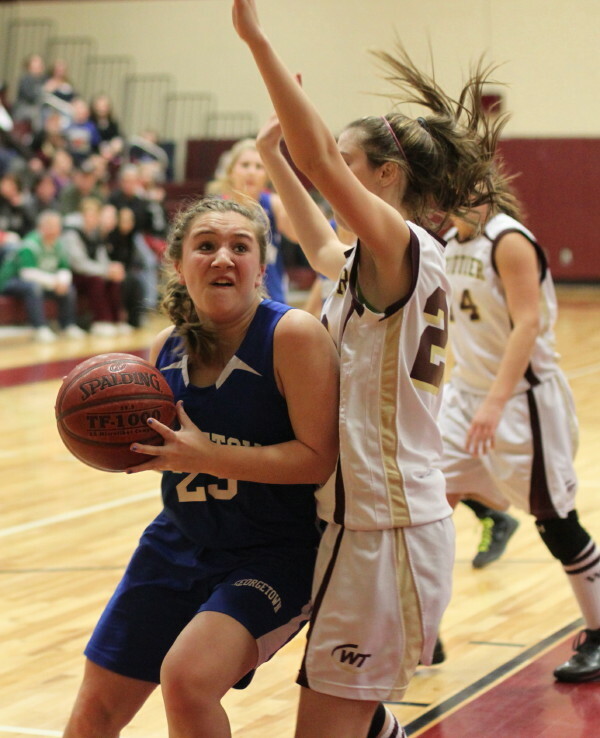 Marisa hit a three and then three straight Wildcat turnovers led to Royal scores, two by Marisa and one by Kylie Troy. Suddenly, G’town had the lead (40-38) halfway through the third period. Christina Medley had answers. 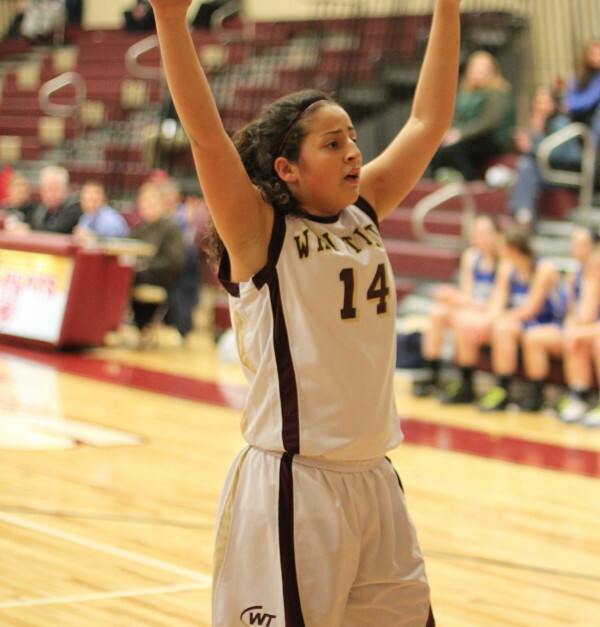 She hit a jump shot, nailed a three (from Kendra Brasil) and set Kendra up for a long one. That was an eight-point run to now give Whittier the advantage, 46-40. Georgetown capitalized on another Whittier turnover (they had twenty-two) very late in the 3rd quarter that gave Marisa a layup with two seconds left. Whittier led, 50-46, at the end of the quarter. Kristin’s quick four points put Georgetown in front, 56-55, with 5 ½ to play. A Morgan Gott triple boosted the advantage to 62-58 with four to play. But back came Whittier on a three by Christina and two free throws from Catherine Roache to tie the game 63-63 with 2 ½ minutes left. 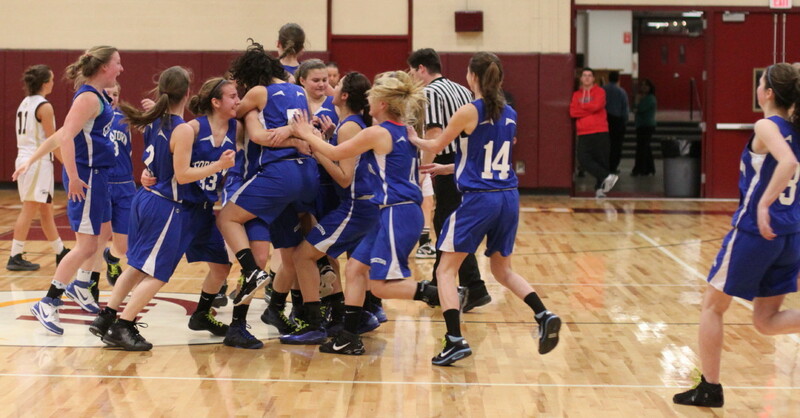 The Royals made the big plays thereafter and came away with the tournament win. 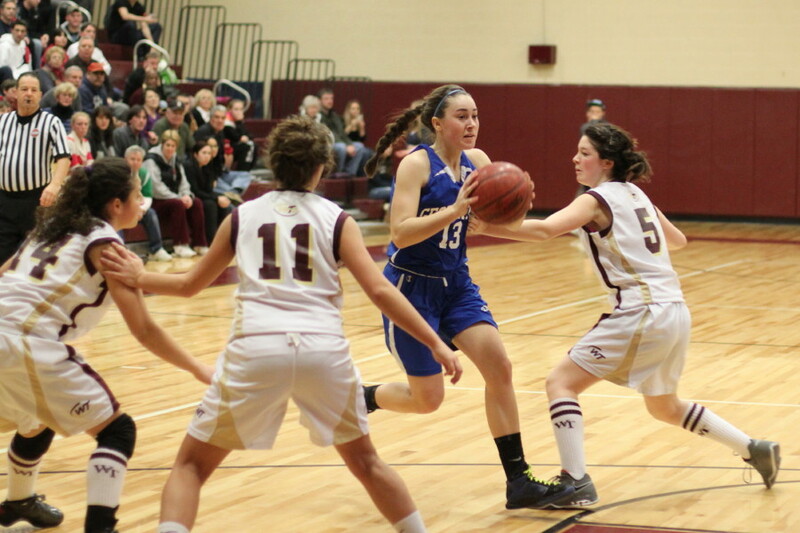 Marisa Agganis was a Cape Ann League All-Star this season. 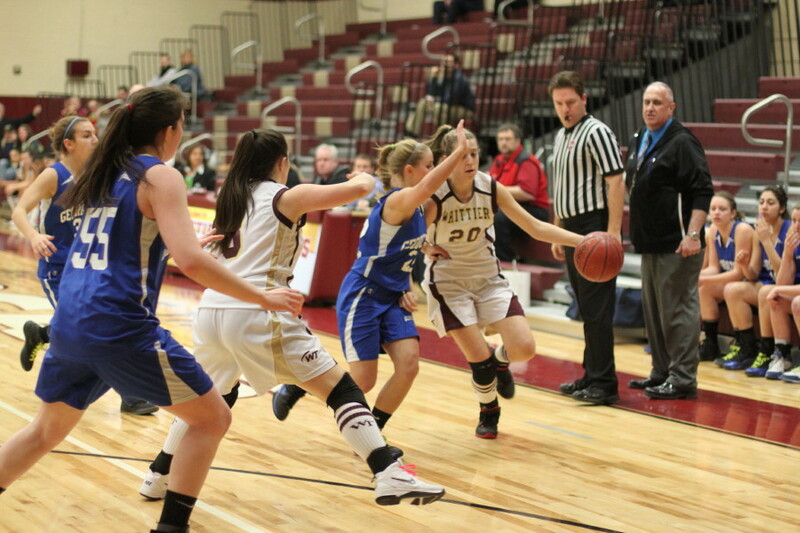 She showed why in the second half of this game with fifteen points and numerous steals. She also took a pretty hard foul late in the game. Kristin Hogan injured fingers on her shooting hand early in the third quarter. She was out of the game for a while. The rest may have helped her as she scored Georgetown’s first ten points in the final quarter in the first 2 ½ minutes. 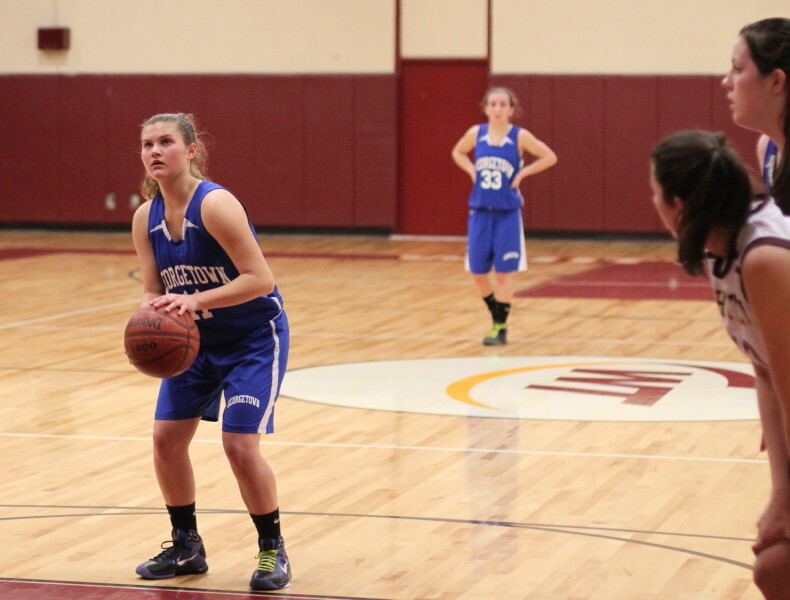 Christina Medley made plenty of 3’s in pregame and continued the accuracy in the game itself. 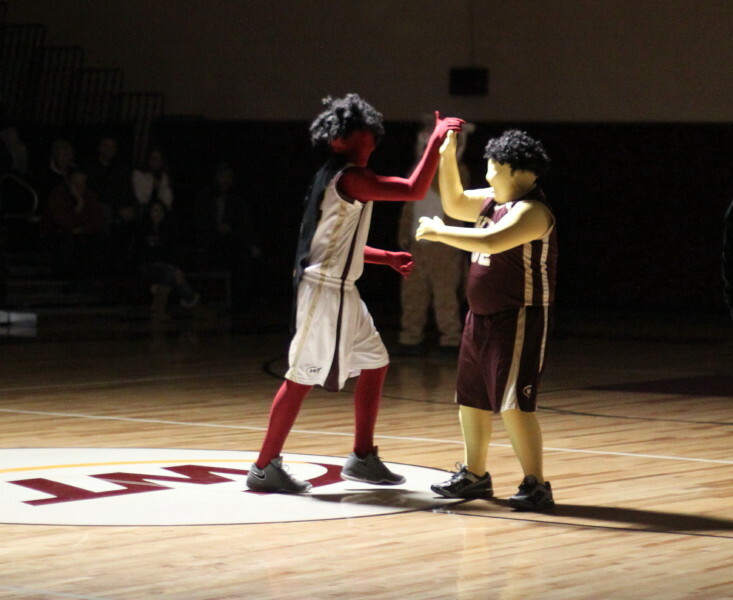 Whittier staged a pregame light show. I thought I was at the TD North Garden…..well, not quite. Georgetown plays #3 seed Fenway on Friday night at Burke High School in the D3 North quarter-finals.